I recieved an inbox on here and to my email address, saying this. I have hid some of the details to stop others getting scammed. Is this a Scam? btw - surely tons of players have received, right? Thanks for reporting this to us, ccmimo! This is clearly a phishing account and now has been banned. Please always remember that Zynga will never direct you to a site or link to input your Facebook credentials. For more information on how to protect your account, feel free to visit this link. Keep safe and have a great day! I recieved an inbox on here and to my email address, saying this. I have hid some of the details to stop others getting scammed. Is this a Scam?! Hi CraxyDavidP! The said accounts were also suspended. Feel free to PM us (Forum Moderators) if you have encountered any suspicious posts or mails. Thanks! I didnt click on the link and Id advise not to do so. You are my favorite forum user, glad we had this discussion. 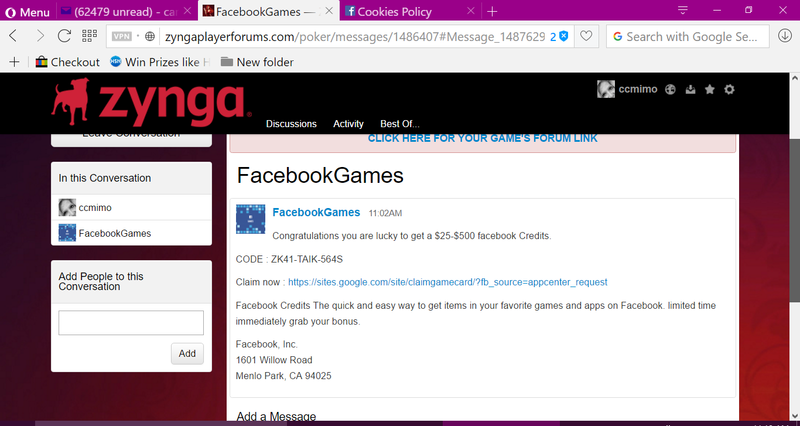 I was hacked in March of this year thru zynga facebook account and now there is someone who has sent me 3 messages through this forum and two of the accounts are banned and the third one is still showing new user and they are trying to get me to click a link for free facebook money for games or a game code I just want to bring it to the attention of everyone so they can keep their money safe. The name of the person who is not yet banned is Games.. here is what I copied and pasted. I guess to put it nicely I dont need this ****. The other 2 messages show from banned accounts with these user names:FacebookGames, and GameeCard with same message as below but accounts banned. Congratulations you are lucky to get a $25-$500 facebook Credits. Precautions to safeguard your computer and mobile device from hackers and other threats should always be taken to protect your information. Do not click on suspicious links offering "free chips"
Be cautious when navigating the internet. It is your responsibility to protect your information. How to make a virus and send it in a message? Easy! User called RewardsCentre probably sent me a message with a virus. Could you please do something? Thanks for sharing this, CraxyDavidP! 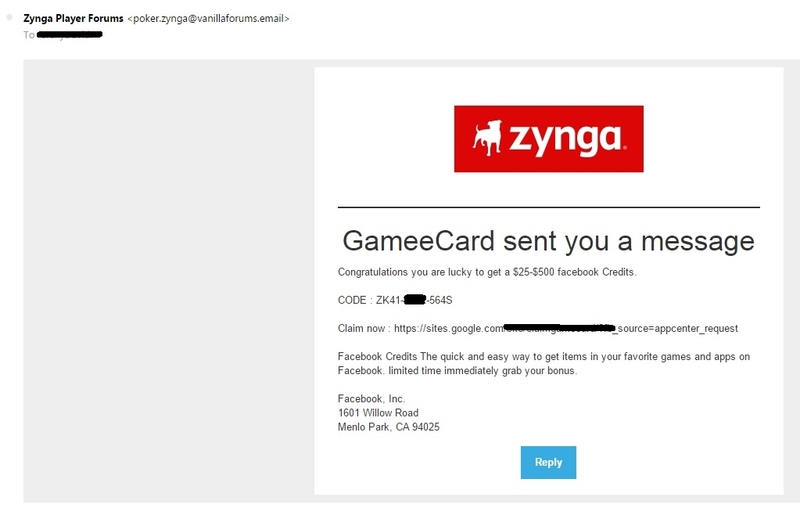 You may have received one or more mails from RewardsCentre, GameCard, GameeCard, and FacebookGames regarding Facebook credits, billion Chip rewards, etc. Those are unauthorized mails and not associated with the team; please ignore and delete them. You may also visit this link for more information on how to protect your account. Keep safe and have a great day! Facebook Credits The quick and easy way to get items in your favorite games and apps on Facebook. limited time immediately grab your bonus. I got a message from a scammer who tried to give me 1b in chips but has been banned . There are scammers here who want your info anything to steal from you. You don.t know if you are safe from scammers who prey on the weak.